To wash down my food today I kept it Dutch, and picked up some 5% Heineken( the all round green can). 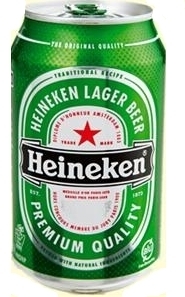 Now I hear you say I am a philistine but 5% Heineken is so hard to get sometimes, its the one you get in Holland. It tastes drastically different to 4.3% stuff sold in Ireland. Got 4 for 8 euro over at Mac's Off License on the Ennis Road Limerick beside the Holy Rosary church. If you are looking for an excellent off license pop in to Paul, he knows so much about booze, be it beer or wine. One of the best off license's in Limerick.